HomeBillCitizenship Amendment Bill 2016 - All you need to know. Citizenship Amendment Bill 2016 - All you need to know. What is Citizenship Amendment Bill, 2016 ? 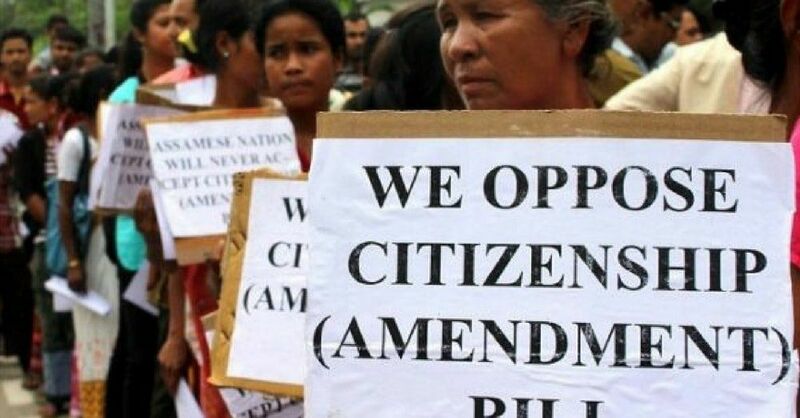 In recent weeks, Assam has seen many protests over the proposed Citizenship Amendment Bill, 2016. The Bill has been termed “Anti-Assam” by BJP's ally Asom Gana Parishad, and similarly criticised by other regional parties. And, earlier this month, when the Joint Parliamentary Committee on the Bill visited Assam and Meghalaya to hear from the locals, it did so amid protest voices which said the move would make Assam a “dumping ground for Hindu Bangladeshis”. What does the aim of the Bill? With The Citizenship (Amendment) Bill, 2016, the government plans to change the definition of illegal migrants. The Bill, introduced in the Lok Sabha on July 15, 2016, seeks to amend the Citizenship Act, 1955 to provide citizenship to illegal migrants, from Afghanistan, Bangladesh and Pakistan, who are of Hindu, Sikh, Buddhist, Jain, Parsi or Christian extraction. However, the Act doesn’t have a provision for Muslim sects like Shias and Ahmediyas who also face persecution in Pakistan. When did this idea gain stream? The BJP had promised to grant citizenship to Hindus persecuted in the neighbouring countries during the 2014 General Election. In the party's election manifesto, the BJP had promised to welcome Hindu refugees and give shelter to them. According to the Citizenship Act, 1955, an illegal immigrant is one who enters India without a valid passport or with forged documents. Or, a person who stays beyond the visa permit. Why and who all are opposing the Bill in Assam? BJP's coalition partner Assam Gana Parishad has threatened to cut ties with the party if the Bill is passed. It considers the Bill to work against the cultural and linguistic identity of the indigenous people of the State. NGOs such as The Krishak Mukti Sangram Samiti and students' organisation All Assam Students’ Union also have come forward opposing the Bill. All Opposition parties, including the Congress and the All India United Democratic Front, have opposed the idea of granting citizenship to an individual on the basis of religion. It is also argued that the Bill, if made into an Act, will nullify the updated National Registration of Citizenship (NRC). The process of updating the NRC is currently underway in Assam. What is National Register of Citizens? The National Register of Citizens (NRC) is meant to identify a bona fide citizen. In other words, by the order of the Supreme Court of India, NRC is being currently updated in Assam to detect Bangladeshi nationals who might have entered the State illegally after the midnight of March 24, 1971. The date was decided in the 1985 Assam Accord, which was signed between the then Prime Minister Rajiv Gandhi and the AASU. The NRC was first published after the 1951 Census in independent India when parts of Assam went to the East Pakistan, now Bangladesh. The first draft of the updated list was concluded by December 31, 2017. The second draft is yet to be released. While Bill is designed to grant citizenship to non-Muslim refugees persecuted in neighbouring countries, NRC does not distinguish migrants on the basis of religion. It will consider deporting anyone who has entered the State illegally post-March 24, 1971, irrespective of their religion. Currently, there are six detention camps for illegal migrants in Assam but it’s still not clear how long the people will be detained in these camps. The process of deportation or duration of detention is not clear as it has not been stated by the government. But if the Bill becomes an Act, the non-Muslims need not go through any such process, meaning this will be clearly discriminating against Muslims identified as undocumented immigrants. Other than Assam, what are the States likely to be affected? States sharing borders with Bangladesh, Pakistan and Afghanistan are likely to be affected. The Meghalaya Democratic Alliance (MDA) government, an ally of the BJP, has opposed the Bill. Calling the bill "dangerous," the Meghalaya government said that they don't agree with the idea of non-Muslims acquiring citizenship after six years of living in the country. What's the status of the Bill now? The Bill after been discussed in the Lok Sabha, was referred to a joint select committee in August 2016. The members of the Parliamentary Committee visited Barak Valley, the Bengali-majority area of Assam, and Meghalaya to discuss it with various organisations. They reportedly spoke to about 200 organisations.